I made lunch yesterday with whatever I had floating around the kitchen: frozen (fresh) lasagna pasta, frozen cooked shrimp, can of sardines (Matiz from Balducci's - absolutely delicious), frozen edamame, fresh parsley, fresh lemon. I let the frozen lasagna noodles defrost on the counter and cut them into 1 inch wide strips - a la parpadelle. I defrosted the shrimp in cool water. In salted boiling water, cook the pasta. In a medium skillet over medium heat, I quickly cooked the sardines in olive oil with sprinkle of hot pepper flakes, then added the shrimp, frozen edamame, added a squeeze of lemon. Remove the cooked pasta from the water into the skillet and blend with the fish. Add chopped fresh parsely and a dash of good olive oil. Serve. Clean, delicious, balanced flavors - a lovely lunch. It would have been better with a nice crisp Italian white wine with some zingy acidity. Shrove Tuesday was yesterday (see this Wikipedia post for the meaning of Shrove Tuesday) -basically it is Pancake Day in England. Growing up in England, we always made pancakes for dinner on this day. Bear in mind, our definition of pancakes was basically crepes. I have fond memories of flipping the pancakes and eating them with lemon juice and sugar. I always really wanted the american version of pancakes with maple syrup. Melt the butter to a medium saucepan over medium heat, add the flour and stir for a few minutes. Add the milk and stir until thickened - it should happen pretty quickly. Add the cheese and stir until melted. Steam the broccoli for about 5 minutes, remove from the pan, and slice the florets length ways. Put the sifted flour and a pinch of salt in a bowl and gradually beat in the eggs and milk. Mix until lump free, but don't over mix the ingredients. Whisk in the melted butter. Heat the oven to 275 degrees to keep the cooked pancakes warm. I used a small non-stick frying pan which obviously made small pancakes. Over medium heat, add some vegetable oil to the pan and wipe off with a paper towel. Pour some batter into the pan - enough to coat a thin layer over the pan - tilting the pan and moving the mix around the pan. Cook for about 30 seconds until golden and flip over. Cook for another 30 seconds or so. Take the cooked pancake, spread a spoonful to cheese sauce on half the pancake, add a slice of ham, and three slices of broccoli. Put on a plate and put in the oven to keep warm. I had some broccoli and cheese sauce left over and just poured the cheese sauce over the broccoli - it was delicious. You could also add grated cheese and breadcrumbs on top and put in the oven to brown - serve as a side dish. Sunday was Oscar night and I needed to bring a dip - I love fish spreads, dips, salads - and this is one of my favorites. It is easy to make and is a consistent crowd pleaser. The base for this recipe is from Bon Appetit magazine (December 2007). Mix the cream cheese, green onion, chopped dill, and lemon juice. Add the smoked trout and stir gently to blend. Season with salt, pepper, and additional lemon juice, as needed. I have always used reduced fat cream cheese instead of marscapone cheese. I have purchased smoked trout from the grocery store - you'll find it in the same section as the packaged smoke salmon. I found smoked trout at the Lobster Place seafood market in Chelsea Market and it was delicious. If you can find smoked trout from a fish market, I would highly recommend using it instead of the packaged version. I made some infused vodkas as a gift yesterday evening (raspberry, cucumber, Earl Grey tea) and as a result had some vodka (Stolichnaya) and cucumber left over. I also had some El Maestro Sierra Fino sherry left over from pre-theater aperitifs. In a tumbler, I poured the vodka over rocks, added thinly sliced cucumber, and a splash of sherry. Basically, this cocktail is a riff on a vodka martini on the rocks. It is clean, refreshing, and delicious. 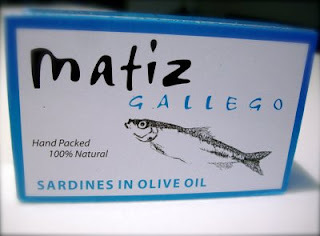 I have recently been exploring the joys of sardines with a foodie friend of mine. So far we have explored the delights of fresh, canned, and aged canned sardines. I have purchased fresh Portuguese sardines a couple of times from the Citarella's on the upper west side in New York - here they will prepare (read gut) them for you which makes life very easy. Preparing fresh sardines is a cinch - dust them with some flour and season with salt and pepper. Then pan fry them in olive oil. When they are golden on both sides, remove from the pan and serve with a wedge of lemon and a nice hunch of bread. They are easy to fillet and the taste is just magnificent. Pair with a nice crisp white wine (Spanish or Italian are perfect). Most recently I had them with a Do Ferreiro 2006 Rebisaca from Rias Baixas which has a lovely salinity, minerality, and leaness that matches perfectly with the sardines. Canned sardines are the perfect little snack or hors d'oeuvres and they are also very cheap. As with most products, some are better than others and the best are stored in olive oil. I would steer clear of any fish canned in water. We are still working out way through all the cans we can find, but may favorite two so far are: Matiz and Connetable. I just keep it simple serving canned sardines - open the can and put the sardines and oil in a bowl - and serve with salt, lemon, bread on the side. Again - pair with a nice crisp, lean white wine - what a great combination. Connetable sells vintage (read aged) sardines that are more expensive ($10.99 rather than $2.99) and the taste is more delicate and rounded than the non-vintage sardines. In New York, I have found the best selections at Balducci's although I am looking forward to heading to Despana to check out there selection. Last night I made a three mushroom risotto with fresh shiitake mushrooms and dried morels and porcini mushrooms. Risotto, being a labor of love, requires constant stirring and attention, but the results can be delicious. Beyond the constant stirring and attention, another challenge is that leftover risotto really can never be as good the next day. This is where risotto cakes come in. With a simple combination of flour, egg wash, and bread crumbs (panko preferred) the risotto can be made into fantastic pan-fried cakes of deliciousness. Simply take a small handful of risotto, dip in flour, egg wash, and bread crumbs, and pan fry in olive oil. Don't make the cakes too big or the resulting cakes will be too fried on the outside or too cold on the inside. They make a delicious lunch with a side salad and a glass of crisp white wine.